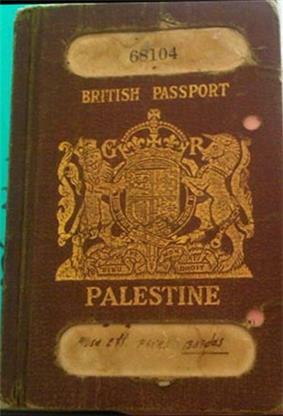 Palestine (Arabic: فلسطين‎ Filasṭīn, Falasṭīn, Filisṭīn; Greek: Παλαιστίνη, Palaistinē; Latin: Palaestina; Hebrew: פלשתינה Palestina) is a geographic region in Western Asia between the Mediterranean Sea and the Jordan River. It is sometimes considered to include adjoining territories. The name was used by Ancient Greek writers, and was later used for the Roman province Syria Palaestina, the Byzantine Palaestina Prima, and the Umayyad and Abbasid province of Jund Filastin. 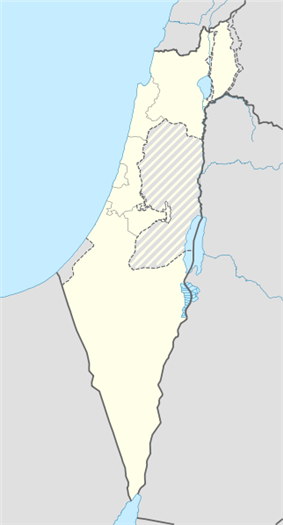 The region is also known as the Land of Israel (Hebrew: ארץ־ישראל Eretz-Yisra'el), the Holy Land or Promised Land, and historically has been known as the Southern portion of wider regional designations such as Canaan, Syria, ash-Sham, and the Levant. Situated at a strategic location between Egypt, Syria and Arabia, and the birthplace of Judaism and Christianity, the region has a long and tumultuous history as a crossroads for religion, culture, commerce, and politics. The region has been controlled by numerous peoples, including Ancient Egyptians, Canaanites, Israelites, Assyrians, Babylonians, Persians, Ancient Greeks, Romans, Byzantines, the Sunni Arab Caliphates, the Shia Fatimid Caliphate, Crusaders, Ayyubids, Mameluks, Mongols, Ottomans, the British, and modern Israelis and Palestinians. The boundaries of the region have changed throughout history. Today, the region comprises the State of Israel and Palestinian territories in which the State of Palestine was declared. Depiction of Biblical Palestine in c. 1020 BCE according to British Mandate for Palestine. Herod's Temple in Jerusalem functioned as the spiritual center of the various sects of Second Temple Judaism until it was destroyed in 70CE. This picture shows the temple as imagined in 1966 in the Holyland Model of Jerusalem. Palestine was conquered by the Islamic Empire, beginning in 634 CE. In 636 CE, the Battle of Yarmouk during the Muslim conquest of Syria marked the new Muslim hegemony over the region, which became known as Jund Filastin within the province of Bilâd al-Shâm (Greater Syria). The majority of the population was Christian and was to remain so until the conquest of Saladin in 1187. The invasion appears to have had little impact on social and administrative continuities for several decades. [lower-roman 7] The word 'Arab' at the time referred predominantly to Bedouin nomads, though Arab settlement is attested in the Judean highlands and near Jerusalem by the 5th century, and some tribes had converted to Christianity. The local population engaged in farming, which was considered demeaning, were called Nabaț, referring to Aramaic-speaking villagers. An ḥadīth, brought in the name of a Muslim freedman who settled in Palestine ordered them not to settle in the villages, for he who abides in villages it is as if he abides in graves.' In 661 CE, with the assassination of Ali, Muawiyah I became the uncontested Caliph of the Islamic World after being crowned in Jerusalem. The Dome of the Rock, completed in 691, was the world's first great work of Islamic architecture. The Umayyads, who had spurred a strong economic resurgence in the area, were replaced by the Abbasids in 750. 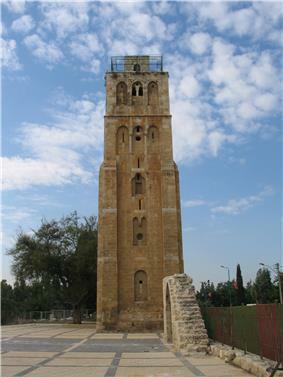 Ramla, the major city, became the administrative centre for the following centuries. Tiberias became a thriving centre of Muslim scholarship. From 878, Palestine was ruled from Egypt by semi-autonomous rulers for almost a century, beginning with the Turkish freeman Ahmad ibn Tulun, for whom both Jews and Christians prayed when he lay dying and ending with the Ikhshidid rulers. Reverence for Jerusalem increased during this period, with many of the Egyptian rulers choosing to be buried there. However, the later period became characterized by persecution of Christians as the threat from Byzantium grew. The Fatimids, with a predominantly Berber army, invaded the region in 970, a date that marks the beginning of a period of unceasing warfare between numerous enemies, which destroyed Palestine, and in particular devastating its Jewish population. Between 1071-73, Palestine was captured by the Great Seljuq Empire, only to be recaptured by the Fatimids in 1098, who then lost the region to the Crusaders in 1099. Their control of Jerusalem and most of Palestine lasted almost a century until defeat by Saladin's forces in 1187, after which most of Palestine was controlled by the Ayyubids. A rump crusader state in the northern coastal cities survived for another century, but, despite seven further crusades, the crusaders were no longer a significant power in the region. The Fourth Crusade, which did not reach Palestine, led directly to the decline of the Byzantine Empire, dramatically reducing Christian influence throughout the region. The Mamluk Sultanate was indirectly created in Egypt as a result of the Seventh Crusade. The Mongol Empire reached Palestine for the first time in 1260, beginning with the Mongol raids into Palestine under Nestorian Christian general Kitbuqa, and reaching an apex at the pivotal Battle of Ain Jalut. 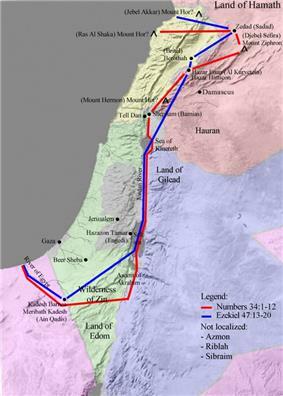 In the 1948 Arab–Israeli War, Israel captured and incorporated a further 26% of the Mandate territory, Jordan captured the region of Judea and Samaria, renaming it to the West Bank, while the Gaza Strip was captured by Egypt. At the Jericho Conference on 1 December 1948, 2,000 Palestinian delegates supported a resolution calling for "the unification of Palestine and Transjordan as a step toward full Arab unity". Following the 1948 Palestinian exodus, also known as al-Nakba, the 700,000 Palestinians who fled or were driven from their homes were not allowed to return following the Lausanne Conference of 1949. In the course of the Six-Day War in June 1967, Israel captured the rest of Mandate Palestine from Jordan and Egypt, and began a policy of Jewish settlements. From 1987 to 1993, the First Palestinian Intifada against Israel took place, which included the Declaration of the State of Palestine in 1988 and ended with the 1993 Oslo Peace Accords and creation of the Palestinian National Authority. The boundaries of Palestine have varied throughout history. [lower-roman 11][lower-roman 12] The Jordan Rift Valley (comprising Wadi Arabah, the Dead Sea and River Jordan) has at times formed a political and administrative frontier, even within empires that have controlled both territories. At other times, such as during certain periods during the Hasmonean and Crusader states for example, as well as during the biblical period, territories on both sides of the river formed part of the same administrative unit. During the Arab Caliphate period, parts of southern Lebanon and the northern highland areas of Palestine and Jordan were administered as Jund al-Urdun, while the southern parts of the latter two formed part of Jund Dimashq, which during the 9th century was attached to the administrative unit of Jund Filasteen (Arabic: جند فلسطين‎). Nineteenth-century sources refer to Palestine as extending from the sea to the caravan route, presumably the Paris Peace Conference in 1919. 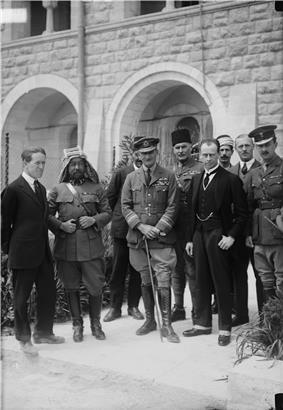 1916–22 Proposals: Three proposals for the post World War I administration of Palestine. The red line is the "International Administration" proposed in the 1916 Paris Peace Conference, and the thin blue line refers to the final borders of the 1923–48 Mandatory Palestine. 1948–67 (Actual): The Jordanian-occupied West Bank and Egyptian-occupied Gaza Strip (note the dotted lines between the territories and Jordan / Egypt), after the 1948 Arab–Israeli War, showing 1949 armistice lines. Borders were acceptable to Israel, but rejected by Jordan and Egypt. 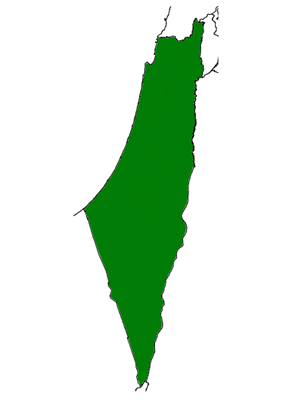 ^ The majority of the international community (including the UN General Assembly, the United Nations Security Council, the European Union, the International Criminal Court, and the vast majority of human rights organizations) considers Israel to be continuing to occupying Gaza, the West Bank and East Jerusalem. The government of Israel and some supporters have, at times, disputed this position of the international community. In 2011, Andrew Sanger explained the situation as follows: "Israel claims it no longer occupies the Gaza Strip, maintaining that it is neither a Stale nor a territory occupied or controlled by Israel, but rather it has 'sui generis' status. Pursuant to the Disengagement Plan, Israel dismantled all military institutions and settlements in Gaza and there is no longer a permanent Israeli military or civilian presence in the territory. However the Plan also provided that Israel will guard and monitor the external land perimeter of the Gaza Strip, will continue to maintain exclusive authority in Gaza air space, and will continue to exercise security activity in the sea off the coast of the Gaza Strip as well as maintaining an Israeli military presence on the Egyptian-Gaza border. and reserving the right to reenter Gaza at will. Israel continues to control six of Gaza's seven land crossings, its maritime borders and airspace and the movement of goods and persons in and out of the territory. Egypt controls one of Gaza's land crossings. Troops from the Israeli Defence Force regularly enter pans of the territory and/or deploy missile attacks, drones and sonic bombs into Gaza. Israel has declared a no-go buffer zone that stretches deep into Gaza: if Gazans enter this zone they are shot on sight. Gaza is also dependent on israel for inter alia electricity, currency, telephone networks, issuing IDs, and permits to enter and leave the territory. Israel also has sole control of the Palestinian Population Registry through which the Israeli Army regulates who is classified as a Palestinian and who is a Gazan or West Banker. Since 2000 aside from a limited number of exceptions Israel has refused to add people to the Palestinian Population Registry. It is this direct external control over Gaza and indirect control over life within Gaza that has led the United Nations, the UN General Assembly, the UN Fact Finding Mission to Gaza, International human rights organisations, US Government websites, the UK Foreign and Commonwealth Office and a significant number of legal commentators, to reject the argument that Gaza is no longer occupied. ", and in 2012 Iain Scobbie explained: "Even after the accession to power of Hamas, Israel's claim that it no longer occupies Gaza has not been accepted by UN bodies, most States, nor the majority of academic commentators because of its exclusive control of its border with Gaza and crossing points including the effective control it exerted over the Rafah crossing until at least May 2011, its control of Gaza's maritime zones and airspace which constitute what Aronson terms the 'security envelope' around Gaza, as well as its ability to intervene forcibly at will in Gaza" and Michelle Gawerc wrote in the same year: "While Israel withdrew from the immediate territory, Israel still controlled all access to and from Gaza through the border crossings, as well as through the coastline and the airspace. ln addition, Gaza was dependent upon Israel for water electricity sewage communication networks and for its trade (Gisha 2007. Dowty 2008). ln other words, while Israel maintained that its occupation of Gaza ended with its unilateral disengagement Palestinians - as well as many human right organizations and international bodies - argued that Gaza was by all intents and purposes still occupied." ^ Krämer 2011, p. 8: "Several scholars hold the revisionist thesis that the Israelites did not move to the area as a distinct and foreign ethnic group at all, bringing with them their god Yahwe and forcibly evicting the indigenous population, but that they gradually evolved out of an amalgam of several ethnic groups, and that the Israelite cult developed on “Palestinian” soil amid the indigenous population. This would make the Israelites "Palestinians" not just in geographical and political terms (under the British Mandate, both Jews and Arabs living in the country were defined as Palestinians), but in ethnic and broader cultural terms as well. While this does not conform to the conventional view, or to the understanding of most Jews (and Arabs, for that matter), it is not easy to either prove or disprove. For although the Bible speaks at length about how the Israelites "took" the land, it is not a history book to draw reliable maps from. There is nothing in the extra-biblical sources, including the extensive Egyptian materials, to document the sojourn in Egypt or the exodus so vividly described in the Bible (and commonly dated to the thirteenth century). Biblical scholar Moshe Weinfeld sees the biblical account of the exodus, and of Moses and Joshua as founding heroes of the "national narration," as a later rendering of a lived experience that was subsequently either "forgotten" or consciously repressed -- a textbook case of the "invented tradition" so familiar to modern students of ethnicity and nationalism." ^ Ahlström 1993, p. 655-741, 754-784. ^ David F. Graf, 'Petra and the Nabataeans in the Early Hellenistic Period: the literary and archaeological evidence,' in Michel Mouton,Stephan G. Schmid (eds. ), Men on the Rocks: The Formation of Nabataean Petra, Logos Verlag Berlin GmbH, 2013 pp.35-55 pp.47-48:'the Idumean textgs indicate that a large portion of the community in southern Palestine were Arabs, many of whom have names similar to those in the "Nabataean"onomasticon of later periods.' (p.47). ^ Flusin 2011, p. 199-226, 215: "The religious situation also evolved under the new masters. Christianity did remain the majorityu religion, but it lost the privileges it had enjoyed." ^ Phillipp 2013, pp. 42-43. ^ Joudah 1987, pp. 115-117. ^ Kimmerling & Migdal 2003, pp. 7-8. ^ Krämer 2011, p. 120: "In 1914 about 12,000 Jewish farmers and fieldworkers lived in approximately forty Jewish settlements -- and to repeat it once again, they were by no means all Zionists. The dominant languages were still Yiddish, Russian, Polish, Rumanian, Hungarian, or German in the case of Ashkenazi immigrants from Europe, and Ladino (or "Judeo-Spanish") and Arabic in the case of Sephardic and Oriental Jews. Biblical Hebrew served as the sacred language, while modern Hebrew (Ivrit) remained for the time being the language of a politically committed minority that had devoted itself to a revival of "Hebrew culture." ^ Pappé 1994, p. 87-101 and 203-243. ^ General Assembly Votes Overwhelmingly to Accord Palestine ‘Non-Member Observer State’ Status in United Nations 2012. ^ Yohanan Aharoni (1 January 1979). 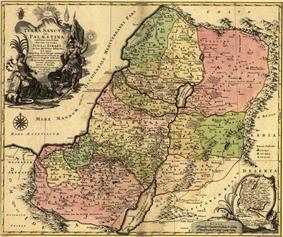 The Land of the Bible: A Historical Geography. Westminster John Knox Press. p. 64. Abu-Manneh, Butrus (1999). "The Rise of the Sanjak of Jerusalem in the Late Nineteenth Century". In Ilan Pappé. The Israel/Palestine Question. Routledge. Adwan, Sami (2006). "Textbooks in the Palestinian National Authority". In Charles W. Greenbaum, Philip E. Veerman, Naomi Bacon-Shnoor. Protection of Children During Armed Political Conflict: A Multidisciplinary Perspective. Intersentia. p. 231–256. Ahlström, Gösta Werner (1993). The history of ancient Palestine. Avni, Gideon (2014). The Byzantine-Islamic Transition in Palestine: An Archaeological Approach. Oxford University Press. Biger, Gideon (2004). 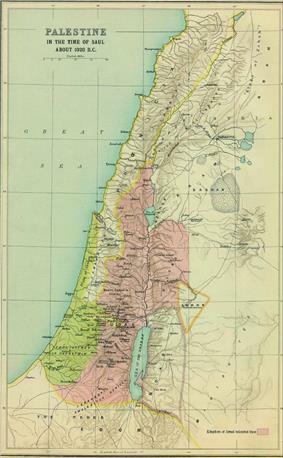 The Boundaries of Modern Palestine, 1840–1947. RoutledgeCurzon. passim. Büssow, Johann (2011). Hamidian Palestine: Politics and Society in the District of Jerusalem 1872-1908. BRILL. Burns, Ross (2005). Damascus: A History. London: Routledge. .
Fahlbusch, Erwin; Lochman, Jan Milic; Bromiley, Geoffrey William; Barrett, David B. (2005). The encyclopedia of Christianity. Grand Rapids: Wm. B. Eerdmans Publishing. Flusin, Bernard (2011). "Palestinia Hagiography (Fourth-Eighth Centuries)". In Stephanos Efthymiadis. The Ashgate Research Companion to Byzantine Hagiography 1. Ashgate Publishing. Gerson, Allan (2012). Israel, the West Bank and International Law. Routledge. p. 285. Gilbar, Gar G. (1986). 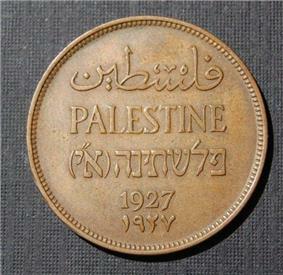 "The Growing Economic Involvement of Palestine with the West, 1865–1914". In David Kushner (ed.) title=Palestine in the Late Ottoman Period: political, social and economic transformation. Brill Academic Publishers. pp. 188–210. Grief, Howard (2008). The Legal Foundation and Borders of Israel Under International Law. Mazo Publishers. Grisanti, Michael A.; Howard, David M. (2003). Giving the Sense: understanding and using Old Testament historical texts (Illustrated ed.). Kregel Publications. Kaegi, Walter Emil (1995). Byzantium and the Early Islamic Conquests (Reprint, illustrated ed.). Cambridge University Press. Jacobson, David (1999). "Palestine and Israel". Bulletin of the American Schools of Oriental Research. Jobling, David; Rose, Catherine (1996). "Reading as a Philistine". In Mark G. Brett. Ethnicity and the Bible. BRILL. Joudah, Ahmad Hasan (1987). Revolt in Palestine in the Eighteenth Century: The Era of Shaykh Zahir Al-ʻUmar. Kingston Press. Krämer, Gudrun (2011). A History of Palestine: From the Ottoman Conquest to the Founding of the State of Israel. Princeton University Press. Lassner, Jacob; Troen, Selwyn Ilan (2007). Jews and Muslims in the Arab world: haunted by pasts real and imagined (Illustrated ed.). Rowman & Littlefield. Lewis, Bernard (1954). "Studies in the Ottoman Archives—I". Bulletin of the School of Oriental and African Studies (University of London) 16 (3): 469–501. McCarthy, Justin (1990). The Population of Palestine. Columbia University Press. Marshall Cavendish (2007). Peoples of Western Asia (Illustrated ed.). Marshall Cavendish Corporation. Martindale, John R.; Jones, A.H.M. ; Morris, John (1992). The Prosopography of the Later Roman Empire, Volume III: AD 527–641. Cambridge University Press. Phillipp, Thomas (2013). Acre: The Rise and Fall of a Palestinian City, 1730-1831. Columbia University Press. Room, Adrian (2006). Placenames of the World: origins and meanings of the names for 6,600 countries, cities, territories, natural features, and historic sites (2nd, illustrated ed.). McFarland. Salibi, Kamal Suleiman (1993). The Modern History of Jordan. I.B.Tauris. pp. 17–18. Schiller, Jon (2009). Internet View of the Arabic World. PublishAmerica. Scholch, Alexander (1985). The Demographic Development of Palestine 1850–1882. International Journal of Middle East Studies XII (4). pp. 485–505. Sharon, Moshe (1988). The Holy Land in History and Thought: papers submitted to the International Conference on the Relations between the Holy Land and the World Outside It, Johannesburg, 1986. Brill Archive. Tessler, Mark (1994). A History of the Israeli-Palestinian Conflict. Hajjar, Lisa (2005). Courting Conflict: The Israeli Military Court System in the West Bank and Gaza. University of California Press. p. 96. Weill, Sharon (2014). The Role of National Courts in Applying International Humanitarian Law. Oxford University Press. p. 22. Sanger, Andrew (2011). M.N. Schmitt, Louise Arimatsu, Tim McCormack, eds. "The Contemporary Law of Blockade and the Gaza Freedom Flotilla". Yearbook of International Humanitarian Law 2010 (Springer Science & Business Media) 13: 429. Gawerc, Michelle (2012). Prefiguring Peace: Israeli-Palestinian Peacebuilding Partnerships. Lexington Books. p. 44. Bianquis, Thierry (1998). "Autonomous Egypt from Ibn Tulun to Kafur 868-969". In Martin W. Daly, Carl F. Petry. The Cambridge History of Egypt, Volume 2. Cambridge University Press. pp. 86–119. Goldberg, Michael (2001). Jews and Christians: Getting Our Stories Straight. Wipf and Stock Publishers. Whitelam, Keith W. (1996). The Invention of Ancient Israel: The Silencing of Palestinian History. Routledge. Saldarini, Anthony (1994). Matthew's Christian-Jewish Community. University of Chicago Press. "General Assembly Votes Overwhelmingly to Accord Palestine ‘Non-Member Observer State’ Status in United Nations". United Nations. 2012. Retrieved 13 Aug 2015.